Review: In ‘Elements of Oz,’ Smartphones Enhance a Celebration of ‘The Wizard of Oz’ Film At “Elements of Oz,” having its premiere as part of the Peak Performances season at Montclair State University here, viewers are encouraged to use smartphones or tablets during the performance. These devices are not, of course, meant to be used for random texting and calling. You download a special app that instructs you to put your phone in airplane mode until the show starts. The app then provides access to various elements that enhance the production, primarily nifty filters that, when you point the phone at the stage, add new layers of imagery to the action. When Dorothy’s house in Kansas flies skyward, for example, you can hold up your phone and see a real corker of a tornado and slashing rain that isn’t apparent to the naked eye. Celebrate Oz! In Coronado, Oct. 17 – Spreckles Park Coronado will celebrate and honor L. Frank Baum’s connection to Coronado with its annual free community celebration of laughter, music, art and make-believe; including Oz characters dressed up and interacting with the children. Join us for the Celebrate Oz! Free Family Festival, which will be held from 9:30 a.m. to 3 p.m. on Oct. 17 at Spreckels Park. The park will be filled with incredible OZ and period music performed by the Coronado Concert Band and Coronado Big Band. Judy Garland show on TV for first time in half-century The digital television network getTV will air “The Judy Garland Show” beginning Oct. 12 as part of its new Variety Night. “The Judy Garland Show” will be televised for the first time since it aired on CBS in the 1963-64 season. Frequent Garland co-star Mickey Rooney appeared on the episode to air Oct. 12. Barbra Streisand, Diahann Carroll, Mel Torme, Bobby Darin, Ethel Merman, June Allyson, Jack Jones, and Garland’s daughters Liza Minnelli and Lorna Luft were among other guests on the series, which will air at 8 p.m. Mondays. ELEMENTS OF OZ Makes World Premiere at Peak Performances The enterprising and endlessly inventive Builders Association dive into The Land of Oz through the use of smartphone interactivity. Three remarkable performers: Moe Angelos, Sean Donovan and Hannah Heller play a range of the beloved characters on the spare stage of the supremely adaptable Kasser Theater. And for this show, you take your seat and are advised to turn on your cell phone. With their smart phones audiences will help create an immersive theater experience with all those remarkable ingredients: the terrifying cyclone, Glinda’s arrival in the bubble, a chorus of giggling munchkins, The Wicked Witch’s fiery exit and yes-the Flying Monkeys. Syracuse-area casino thrives with ‘Wizard of Oz’ theme One of the main attractions at the Yellow Brick Road Casino is a cyclone, based off the same tornado that Dorothy and Toto went through. Chosen at random each day, players have an opportunity to step into this one-of-a-kind cyclone to win cash and prizes. “It was a blast in there. Everything was spinning around, it was just a good time,” said Kurt Beecher, who took a turn inside the Cyclone on Thursday. Every piece of the casino adds to the “Oz” environment. Watch the video to see all the different restaurants and games. 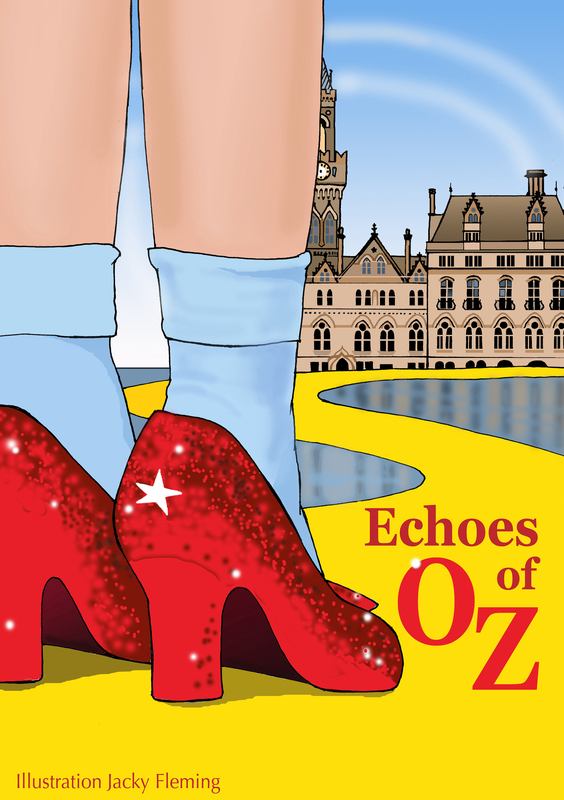 Bradford’s City Park to get ‘yellow brick road’ in Wizard of Oz-inspired event See Bradford City Park transformed with the magic of Oz. Skip along the Yellow Brick Road, play among the fantastical flowers, experience the storm in Dorothy’s House and ride the giant Ruby Slipper Slide. Watch live and light shows, different each day, as Bradford’s communities become Munchkins, Emerald Citizens or Flying Monkeys. Meet Glinda the Good Witch, the Wicked Witch of the West, Professor Marvel or The Great and Powerful Wizard of Oz himself. There’s a new experience all to enjoy each extraordinary day on 9th, 10th and 11th October 2015. Upcountry History Museum: The Wonderful Wizard of Oz September 19, 2015 to January 18, 2016, the Upcountry History Museum will fulfill its mission of connecting people, history and culture through a traveling exhibition titled The Wonderful Wizard of Oz. The 1,500 square foot immersive exhibition is based on the popular and iconic book, The Wizard of Oz, published in 1900, written by L. Frank Baum and illustrated by W.W. Denslow. Built as a larger than life pop-up book, the exhibition is filled with dazzling graphics and immersive Oz experiences showcasing “America’s first fairytale,” a literary classic that spans generations. Local yellow brick road Family heirlooms and memories have always been important to Newton resident Max Regier. Regier and his wife, Nellie, have filled their home with trinkets of years gone by. When a yellow-brick road constructed by his mother in the early 1990s lay dormant in the backyard of her former residence at 816 N. Blaine St., Newton, it was little surprise when Regier eventually went and dug the thing up, rebuilding it in his back yard. That was four years ago. Today the freshly painted road is accented by a sign pointing the Regier’s grandchildren to various Oz-related places and leads from the patio to Nellie Regier’s craft shop, keeping Melinda Brown Regier’s memory alive. A lion, a wizard and a wardrobe I found myself at a dinner sitting next to biographer, playwright, theatre critic extraordinaire and vaudeville royalty, John Lahr. His father Bert, you will recall, played the Cowardly Lion in The Wizard of Oz and was a Broadway stalwart for something like 50 years. I began to panic slightly about the things I mustn’t say. Of course I knew better than to disclose the mountains of Wizard of Oz trivia I have at my fingertips. It would have been a disaster if I had started regaling him with things like, I don’t know, how I’d read that Meinhardt Raabe, the 24-year-old actor who played the Munchkin coroner in The Wizard of Oz, had a massive growth spurt at the age of 35. When the film was shot Raabe was four feet tall. Eleven years later, he was four foot seven, only four inches shorter than La Garland herself. Can you believe it? Creighton Homecoming: Wizard of Oz theme resonates with community “The theme ‘Brain. Heart. Courage.’ truly encapsulates the whole Creighton experience, and is very reminiscent with alumni, students and all Creighton constituents,” Alumni Relations Office Senior Program Coordinator, Kathleen Vazquez said. She spoke of “Brain” as a reminder of Creighton’s principal purpose as an educational institution. “Heart” speaks to the university’s mission, charged by Jesuit values and oriented toward passion and service. And finally, “Courage” is what fuels all members of the Creighton community, former and present, to turn their education outward to impact the world. Goodbye Yellow Brick Road? Even a Wizard Can’t Save Oz From Vandals For this year’s opening, on Oct. 3 and 4, the park made available 7,000 tickets, at $35 each, which sold out in 2½ weeks—twice as fast as last year. Oz can also be rented for private events and Dorothy’s house—before the tornado—rents for about $180 a night. These days, Oz is kitschy and low-tech compared with modern theme parks. The Emerald City is mostly just a green door and some smoke machines. The Cowardly Lion’s lair is in disrepair. Owner Page Leidy says all the revenue from events goes into restoring and maintaining the park. Winged monkeys aren’t a problem, but harsh winters and effects of years of neglect are. Making matters worse are the growing numbers of uninvited visitors. At nearby Appalachian State, an oft-told joke holds that most students have a yellow brick or two in their dorm rooms.